Are you interested in adjustment of status, the ability to obtain lawful permanent residency here in the United States through the immigrant visa process? If you need information about adjustment of status, please keep reading. 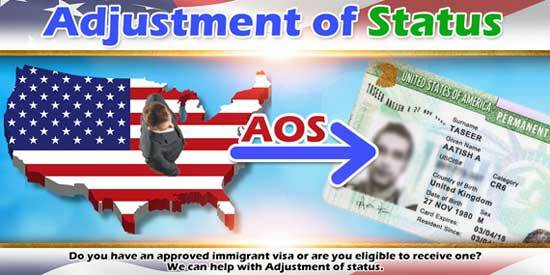 This article on adjustment of status is part of our guide to green cards. If you already know that you need help with adjustment of status, please contact us. Receiving a green card is always a two-step process. The petitioner first files a request for an immigrant visa through form I-130. Once the USCIS approves your immigrant visa, the foreign national applies for it. Once he receives it, and enters the US he becomes a lawful permanent resident. If the foreign national is in the United States, he can collect it in the US without leaving. If the foreign national is outside the US, he or she must receive an immigrant visa through consular processing. Obtaining lawful permanent residency in the United States is a discretionary benefit. It also obviously a benefit with great advantages in terms of saving a trip out of the country. For this to work though, the foreign national must be eligible for the adjustment of status process. Not everyone is eligible for adjustment of status. The most important criteria for determining a foreign national’s eligibility for adjustment of status is the immediate availability of an immigrant visa. The USCIS will not accept an adjustment of status application if you cannot immediately use your immigrant visa petition. If you are the immediate relative of a US citizen, spouse, parent or child, an immigrant visa petition is immediately available for you. You therefore can adjust your status. Let’s look at some examples where that might not be true. One example that sometimes confuses people is having an approved family preference petition. For example, if your spouse is a lawful permanent resident, you may have an approved immigrant visa petition from the USCIS. You have in your hand the I-797 approval notice. But, your immigrant visa petition is a preference one. So you may only use this immigrant visa petition once it becomes current. The Department of State (DOS) tracks when preference visas become current on the Visa Bulletin. At the time of this article, the wait time to use an approved family preference petition for a spouse and children under the age of 21 was approximately 22 months. Besides not being able to use the approved immigrant visa petition, the USCIS bars certain classes of beneficiaries from using the adjustment of status process. Some categories are immediately understandable, like entering the United States without inspection by an immigration officer. Anyone who illegally entered the US after 2001 must receive the green card through consular processing. Other examples are your immigrant visa petition coming through employment, but you worked without authorization for more than six months. Or you entered on a K-1 fiancée visa, but did not marry the person who petitioned for you. Lastly, you were admitted as an exchange visitor and the DOS imposed a two year home residency requirement. In this case, you may not adjust your status until you have met the home residency requirement. Not many people can take advantage of it anymore, but prior to 1996 the Immigration and Nationality Act contained a provision, 245(i) that allowed people who entered the United States without inspection or illegally to pay an additional $1000 fee. The fee was a kind of fine that allowed them to enjoy the discretionary benefit of adjustment of status. Revisions to the Immigration and Nationality Act in 1996 did away with this provision. However, it was resurrected for a brief while. If your petitioner filed an immigrant visa petition with the USCIS that was filed and received by the USCIS before April 30, 2001, and you were present in the United States at the time of its filing, you could use 245i to adjust status. One of the benefits of this provision is that if you were ever eligible for an immigrant visa under 245(i) then you keep that priority date. An example of this is you are the foreign national of a preference petition filed before April 30, 2001 that you never collected. If you married a US citizen, you could use that earlier priority day and adjust using 245(i) in 2017. With an understanding of your eligibility for this benefit, let’s review the adjustment of status process. In filing for adjustment of status, you must include eligibility for the benefit. You would therefore include a copy of the approved immigrant visa petition, a copy of an immigrant visa petition application that was immediately usable by you, or evidence that you entered as a K1 fiancée and married your petitioner. You would include all the other documents required by filing form I485 with the USCIS. Of particular importance is filing form I864, financial affidavit of support in family-based green card applications. Assuming that the USCIS accepts your application and issues receipt notices, USCIS will then call you to a biometrics appointment for fingerprinting and photographs. The USCIS uses the fingerprints to check your criminal record with the FBI. Checking with the FBI often takes 90 days. You don’t often hear from the USCIS until this 90 day period is up unless there is a problem with your application. We find a lot of people call us when they receive an Request for Evidence (RFE) from the USCIS about the application. Many times we find these RFEs relate to I864 affidavit of support issues. You must resolve these issues within 87 days. Otherwise the USCIS will deny the adjustment of status application. USCIS will sometimes require that you and your petitioner attend an interview before you can receive your green card. All applications that involve immediate relatives, a form I-130, immigrant visa petition form, and form I-485, adjustment of status that are filed together require an interview. You attend the interview at the local USCIS office. Assuming that USCIS finds no problem with your application, the examiner will tell you that he is approving your request for lawful permanent residency. After that, you will receive a green card in the mail in approximately seven days. Applications that are based on an approved immigrant visa petition by your employer or applications filed by a fiancée who married his or her petitioner often have the interview waived. This is an advantage in the sense you do not have to travel to the local USCIS office. But it is also a disadvantage. Many times the adjustment of status process may take 10 months to a year before you receive a green card in the mail. We prefer to work with clients who need adjustment of status from the very beginning. However, we have helped many people who filed for a green card on their own. After filing these clients ran into difficulty with the USCIS. We can successfully resolve any issues related to the adjustment of status process with the USCIS for you. If you need help, please contact us.